St. John the Evangelist School is a Catholic parish school for students in preschool through grade 8. Through a flexible, challenging, and diversified curriculum, our goal is to nurture the academic, spiritual, and physical development of each student. We guide the children to appreciate the uniqueness of themselves and others, and to celebrate the diversity in our school and beyond. The school’s administration and faculty strive to provide students with a firm moral and academic foundation that helps students succeed in future challenges and become responsible and caring adults. We welcome the opportunity to give you a tour of our school. Please come, tour the school, meet the principal, and observe classes in session. 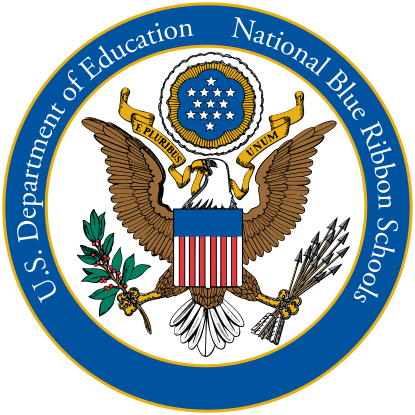 Find out why we have been named a National Blue Ribbon School! Discover this enthusiastic small community with a large heart which offers a faith-based, academically-challenging education. The preschool (4 year old full-day and half-day programs), full-day kindergarten, and grades 1-8 will all be featured. For more information, please contact Angela Colburn at 301 681-7656 or acolburn@sjte.org. Come experience our caring community. We look forward to hearing from you soon! Registered/contributing members of our parish or other Catholic parish who have other children in our school. Non-members of our parish who currently have children in our school. Registered/contributing members to our parish or other Catholic parish with no children in our school. Non-members our parish or other Catholic parish with no children in our school. Parents with other children in our school. Parents new to our school who are interested in remaining in our school beyond Junior Kindergarten. Parents seeking a 4-year-old program. An online application must be completed for each new student. Similarly, an online re-registration must be completed for each returning student. You may access the online system by clicking on the links below or contact the school office. Please click on Online Admission to apply online through TADS. If you need assistance with this process, please contact the school office (301 681-7656). Birth Certificate (Required for each new student). ADW Immunization Policy Acknowledgement and Form completed and signed by physician or health official (Required for each new student). Transcript/Information Request (Required for each new student grade 1 – 8). Submit $100 non-refundable application fee online or to St. John the Evangelist School. Click here to re-enroll online. The Archdiocese of Washington (ADW) and St. John the Evangelist Parish offer financial assistance to both current parents who have children in our school and new families applying to the school. The Archdiocese and the Parish use the services of TADS in making financial aid determinations. The window to apply for ADW tuition assistance for the next school year is October 1 through December 1, 2018. Each family applying for tuition assistance from the Archdiocese of Washington is required to complete a TADS Financial Aid & Assessment form. Please file a TADS application even if it is after the deadline. You must apply for aid through TADS to qualify for either the Archdiocese or the Parish aid. Follow the directions on the Archdiocese TADS site for financial aid. The Parish Tuition Assistance Committee will use the TADS information to make aid recommendations to the Pastor. The Pastor will review the recommendations and make final award determinations. All families must apply to TADS for financial assistance, which now includes the Parish Award Sibling Grant (for grades K through 8). IF YOU DO NOT APPLY FOR AID THROUGH TADS, YOU WILL NOT RECEIVE THE SIBLING GRANT FOR YOUR 2ND, 3RD, etc. CHILD. Please remember that NO FINANCIAL AID ASSISTANCE can be given to anyone who has not submitted a tuition assistance application. This includes receiving the sibling discount.